The Thor™ Patrol Light is used to covertly identify vehicles in Military and Security CONVOYS thru the use of a flashing Infrared Marking Beacon. With the increased number of vehicles in the combat arena, there is an increased need for Identify Friend or Foe (IFF) signaling devices. The Patrol Light provides an IFF Infrared Marking Beacon that can be permanently affixed/mounted to any vehicle. When operating in a CONVOY of vehicles with each vehicle clearly identified via IR beacons – they can easily track each other. Aerial assets can maintain a constant visual by placing the aircraft tracking system on Automatic, once the ground vehicle has been locked on – the IR beacon becomes the objective of the auto-tracker keeping it's movements always on the screen. The Thor Patrol Light provides a flashing IR signature that is visible out to a distance of several miles reducing the risk of Blue on Blue situations when operating in Combat or Contested areas. The Thor Patrol Light is completely waterproof and can be permanently affixed to the exterior roof or side of the vehicle via a set of screws or epoxy for greatest angle and longest range of visibility. Thor is also available in a Constant ON version and in a variety visible colors for non-covert marking. The Patrol Light has been engineered to be connected directly to the vehicle's power source. The Thor beacon has built-in protection to +/- 60 volts to prevent damage to the Patrol Light from vehicle power surges that occur during starting or when other auxiliary equipment is connected to the vehicle power. 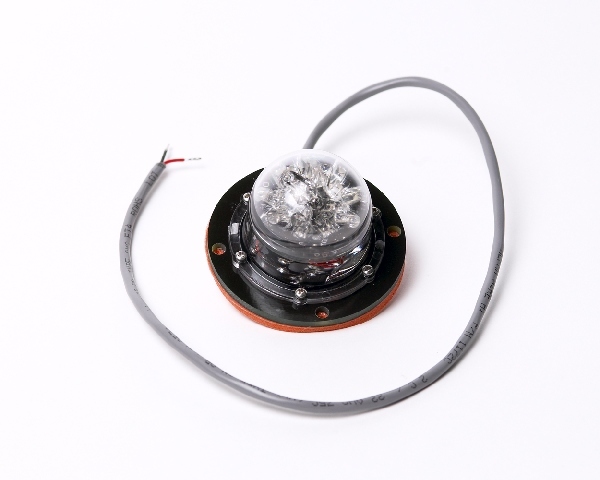 The beacon can also be powered by any other DC source ranging from 12 to 20 volts.